We all want to work in an environment where all our teammates perform well and deliver on their commitments. So what can your managers do to foster accountability with employees? Follow my 4-step process for raising levels of accountability with your work teams. Managers must be highly skilled in these 4 behaviors, and the more they deliver on these with specificity, the more accountability you will derive. Expect. 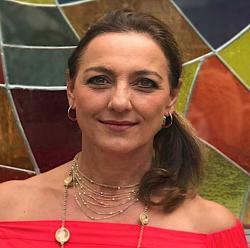 Setting and communicating clear expectations, with specificity, is every manager’s job. Your managers must be crystal clear about what they expect — the outcome they’re looking for, how they’ll measure success, and how people could go about achieving objectives. Guide your managers to build in autonomy where two-way dialogue helps determine if each employee understands what is expected and if they suggest ways to accomplish goals. Inspect. Specifically inspecting what they expect does not mean managers micromanage. Rather it helps them track achievement towards goals. During expectation setting the manager and employee agree on weekly and monthly milestones with clear, measurable, and realistic targets. If any of these targets slip, your managers must address the issue straight away. This approach becomes a good performance management principle. Develop. Your organization wants to attract, develop, and retain great performers. Your managers must ensure that the employee they’re holding accountable actually has the specific skills and resources they need to succeed, otherwise you are setting them up for failure. Coach. Give actionable and specific feedback, weekly. A coaching mindset is one in which managers enable performance rather than reprimand an employee. Discuss gaps between actual vs. expected performance and brainstorm solutions. Identify potential actions to address performance, redesign schedules, provide resources where appropriate, or support in some other way that gets the person back on track. Reward: When performance has improved and personal accountability shown, reward people. Redeploy: While going through the above steps and new information about an employee comes to light, think about moving this person toward another job more appropriate for their talents. Release: When a lack of accountability to address performance is observed, despite manager support, release the person, as they are not suited for this role. 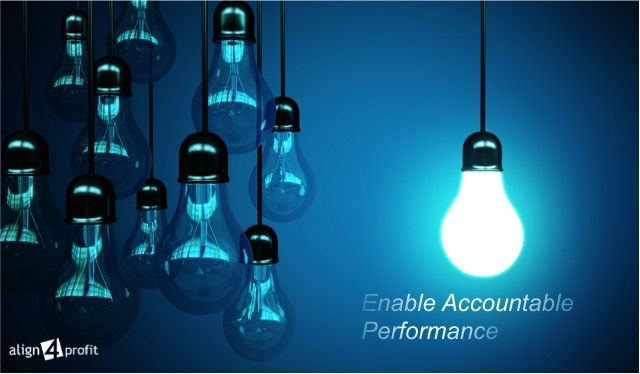 Repeat: If performance is not achieved, repeat all the above steps. Your leaders are all accountable for driving high performance and engagement with their teams. Have your leaders taken accountability for what they can do to help employees succeed? Do they have the skills to deliver on these 4 behaviors with quality? 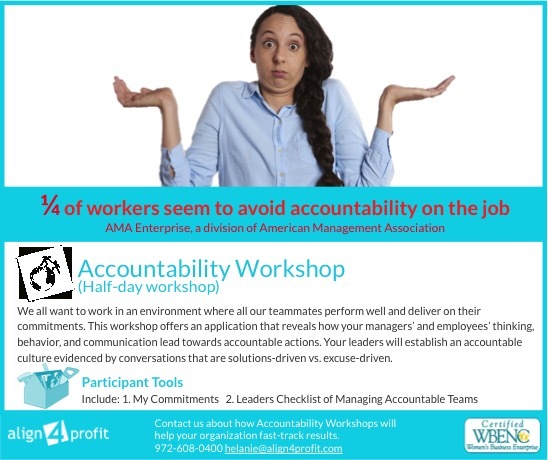 In our Accountability Workshop we provide your managers with practical tools and resources, such as the manager’s checklist to help them become the accountable leaders you expect.